This homemade device delivers information about a plane's altitude, speed, and destination directly to your smartphone or tablet. If you've ever looked up at a plane and wondered where it's headed, this simple project is for you. Thanks to cheap, miniaturized electronics, you can now build a receiver that connects to your smartphone and shows details about all the aircraft in the sky around you. It takes less than an hour and costs about $115. The device receives and decodes ADS-B, a data broadcast from aircraft that transmits a callsign, location, altitude, speed and a few other bits of information. If you live near an airport or under a flight path, there's a good chance you can receive these transmissions easily. A commercial ADS-B receiver can cost $1,000, but the Stratux project receiver we're building uses a Raspberry Pi 3, the low-cost mini computer that's become the basis for hundreds of electronics projects. ADS-B transmits on two frequencies, 978MHz and 1090MHz, so we'll need two radios. We can repurpose a couple of digital TV dongles as wideband software defined radios to pick up the broadcasts. A couple of antennas finishes off the radio portion. The Stratux page has the shopping list. Decoding software can be downloaded from the project website and installed onto a MicroSD card, which is inserted into the Raspberry Pi. And that's about it. It really is plug-and-play construction. The parts cost a total of $115. A GPS dongle is optional and only needed if your phone or tablet doesn't have built-in GPS. 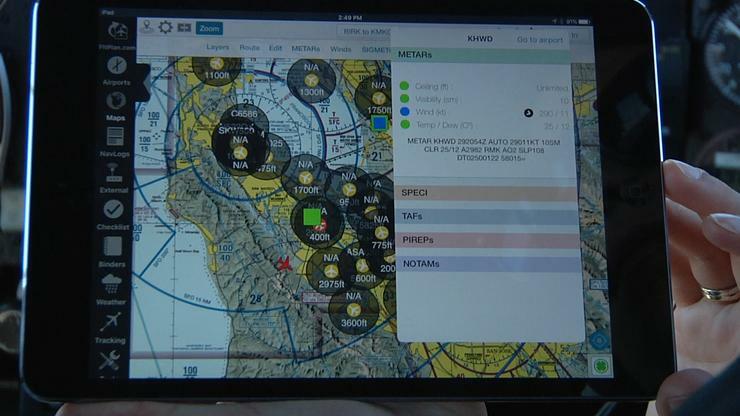 The Raspberry Pi connects to your phone or tablet over WiFi and there are several pieces of software that will make sense of the signals and show planes on a map. 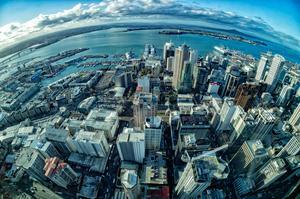 In our tests, we used FltPlan, which was free through Apple's App Store. We downloaded detailed maps for our area through the app. 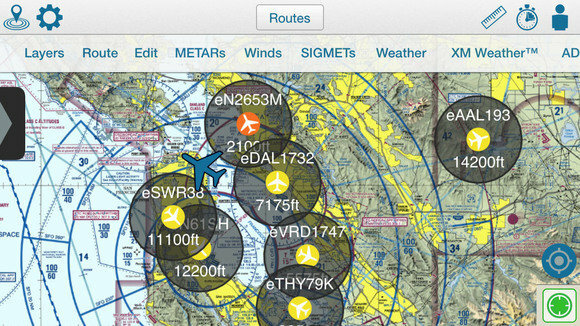 A screenshot from FltPlan on iOS shows air traffic over the San Francisco Bay Area on August 9, 2016. In the image, the blue aircraft is our location in San Francisco (we're displayed as an aircraft even though we were on the ground). Each of the others is a live representation of the aircraft in flight. They are mostly commercial flights, such as American 193 at 14,200 feet on the right of the image. A quick internet search shows it's a flight from San Francisco to Dallas Fort Worth. 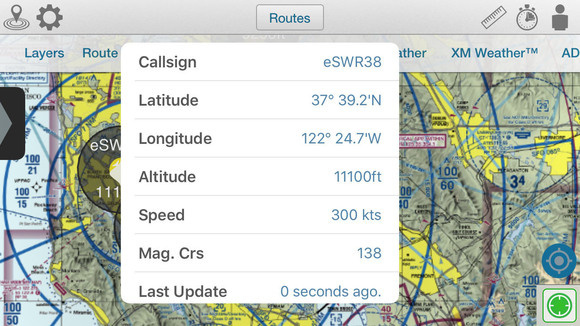 Clicking on any of the aircraft will bring up more data gained through ADS-B. For example, if we click on Swiss Air flight 38 (SWR38), this pops up. You can't see it in the still image, but the information updates every few seconds and it becomes clear the flight is descending. It will eventually turn and land at San Francisco International airport. An internet search confirms Swiss Air 93 is a flight from Zurich to San Francisco. You can see much of the same data on websites like FlightRadar24, but it's fun to make a receiver and get the data yourself. In fact, if you set a permanent reception station, you can feed data to Flightradar 24 and similar sites. The inspiration for building our receiver came from Gediminas Ramanauskas, a software engineer and pilot we met at Maker Faire Bay Area. He had built a unit for his plane and promised to take us flying if we put one together. Earlier this month we took him up on the offer. Here's a look at the receiver in use in a real aircraft.